I Swear I Saw It is an investigation on the performativity of life drawing. Its title refers to visionary anthropologist Michal Taussig’s account on “the fieldwork notebook as a type of modernist literature and the place where writers and other creators first work out the imaginative logic of discovery” (Michael Taussig, I swear I saw this: drawings in fieldwork notebooks, namely my own; The Unversity of Chicago Press, Chicago and London, 2011). Such practice isolates drawing as a unique form of recording experience, as the medium itself cannot but betray the original vision it aims to portray. I Swear I Saw It develops as a series of episodes, each relating uniquely to a place and context. I Swear I Saw It – Ep. I (Spettro), is activated by a draftsman and an electronic music’s composer and is divided into two parts: before and after the entrance of the public. The draftsman documents the passage in the room of a person invited to hold up a sign on where is written: I SWEAR I SAW IT. 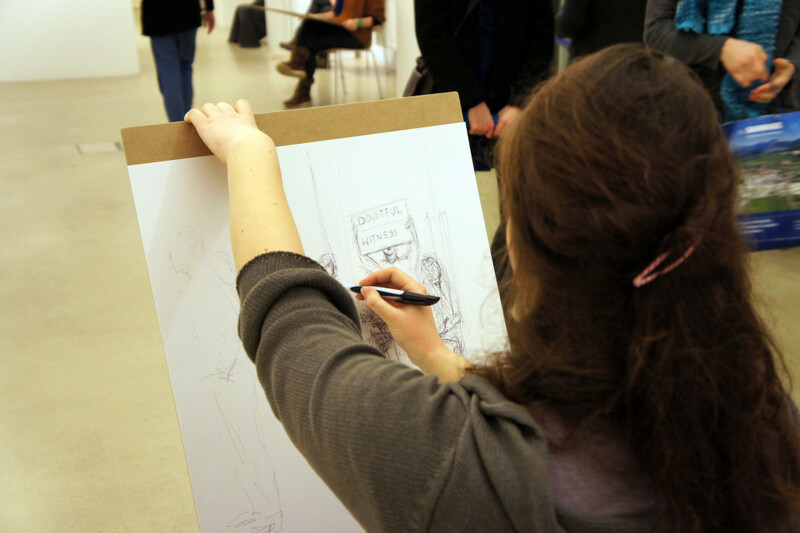 When the audience enters the gallery, the draftsman continues to document their presence on the same sheet. The two phases coexist only in the drawing: it is only there that the public can become aware of the action that took place before their arrival. Finally, with the contribution of guest musician Lorenzo Senni, invited to record the sounds emerging from the draftsman’s movements and the visitors’ presence, a live score has been composed. I Swear I Saw It – Ep. II acts more as an intrusion than its previous installation, following the invitation to take part in Dora García’s extended performance piece, The Inadequate, shown at the Spanish Pavilion, during the 54. Venice Biennale. 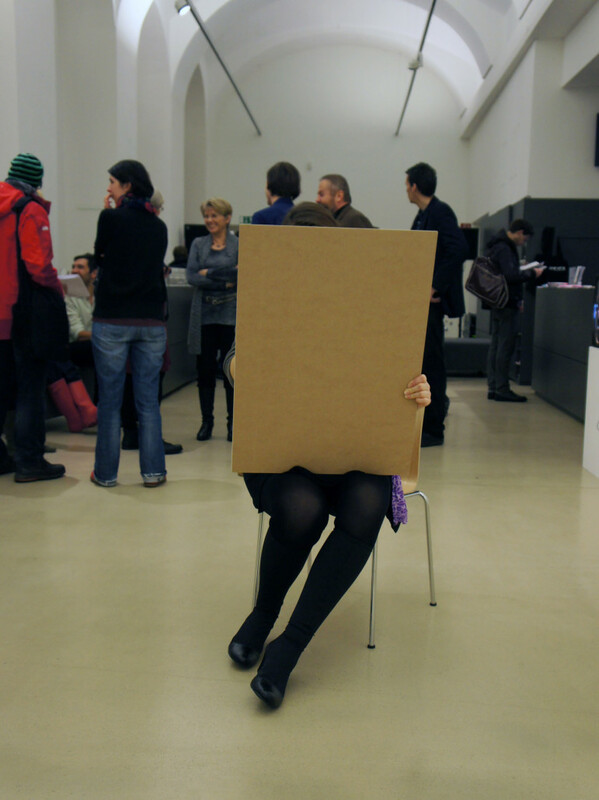 The instructions given to a singular drawer are in this case strictly related to the Spanish artist’s exhibited piece Instant Narrative (2008), “a performance involving an observer in an exhibition space typing on a laptop computer, writing everything she sees and hears, mostly the appearance and behavior of the visitors to that exhibition. This text is projected on a screen somewhere in the exhibition room […]” . 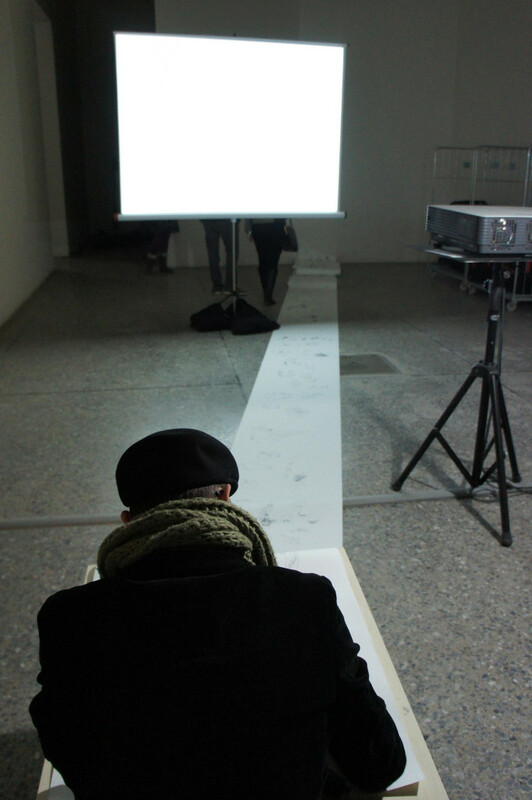 Seated in front of the screen, the drawer relates to the projected text as if it were a script; in so doing he relies on his imagination to reconstruct, by distorting it, the same reality he’s part of. 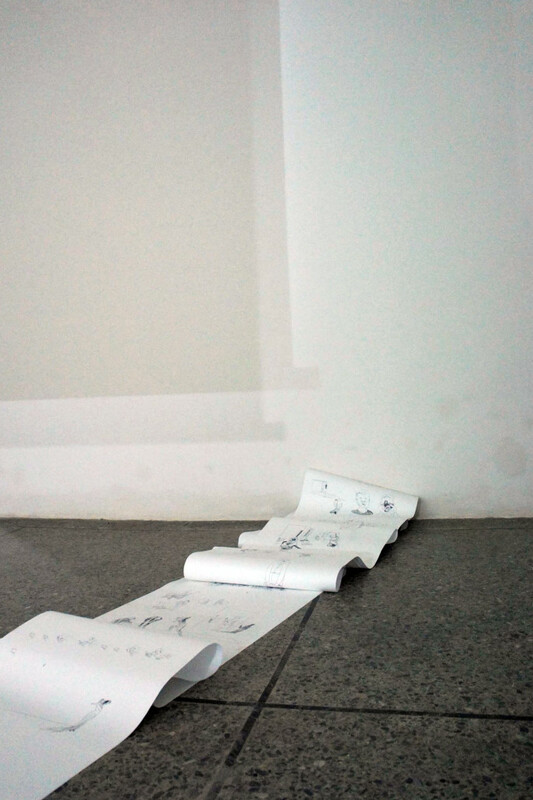 In this episode, the sheet of paper employed is a fifteen-meter long roll that is left to unwind itself on the floor throughout the time frame of the pavilion’s opening hours. I Swear I Saw It. 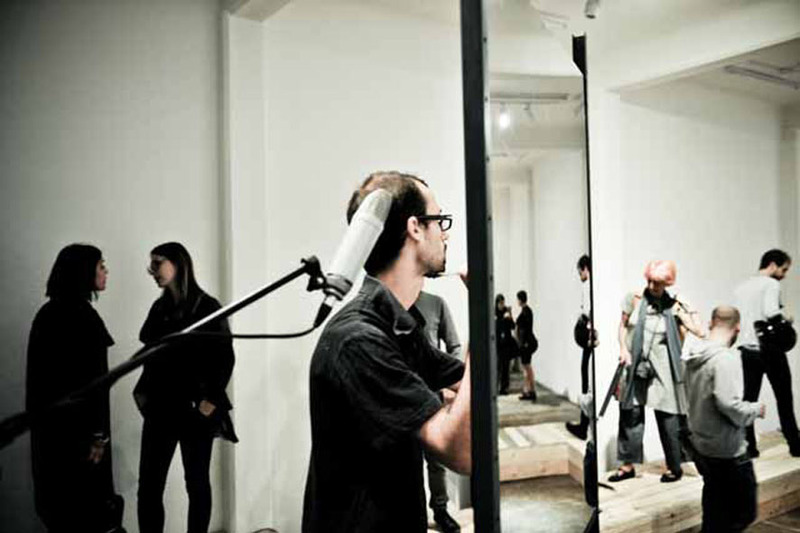 Ep – III makes use of the structure of the pilot episode in order to be part of a group show, this time without the easels or the musician’s presence. 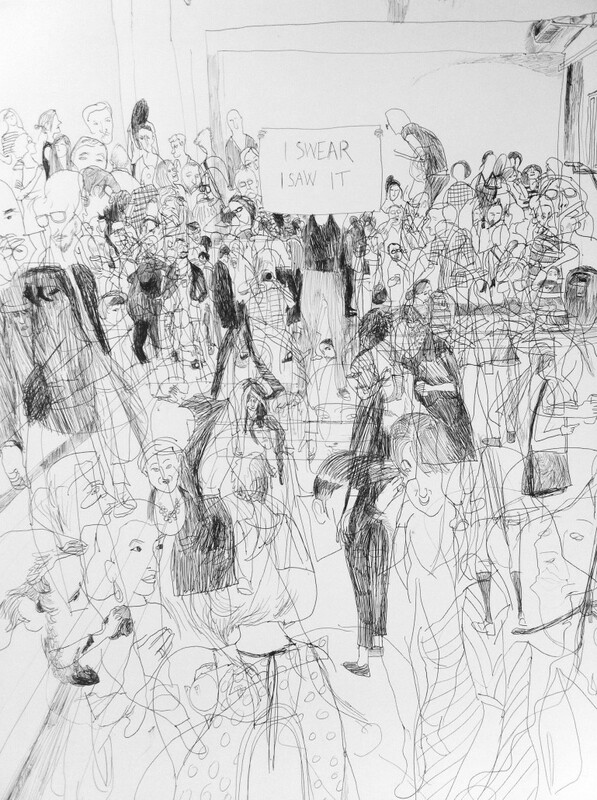 Four drawers, placed in as many different areas of the gallery space, record incessantly, on a single sheet of paper, the passing of the audience during the exhibition’s opening.